It's the season for making merry, and gift-shopping. 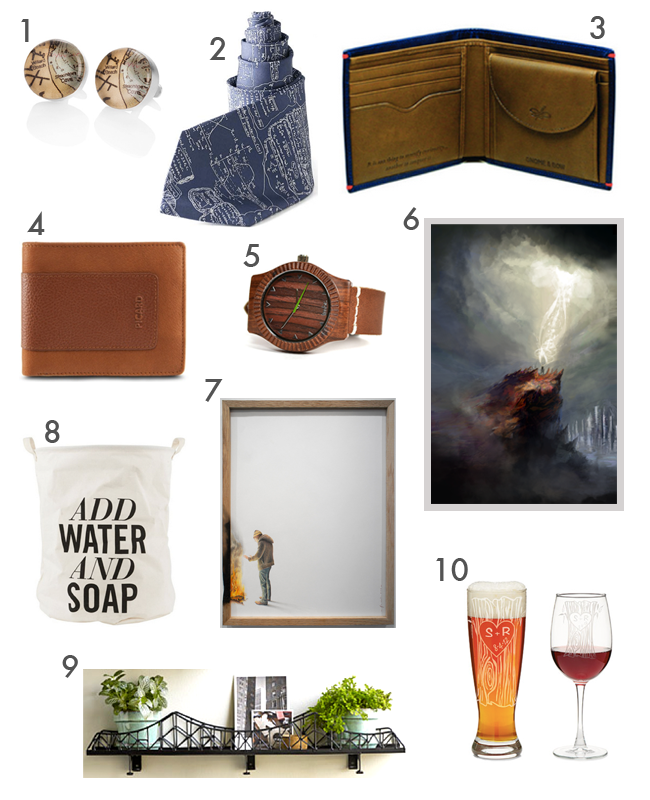 Here are some of our favorite gift picks for your special man. Custom map cufflinks - With these customized cufflinks, he'll be able to carry his favorite map on his sleeve. Math formulas tie - If your man is a math whiz, this would be a perfect gift for him. Regent Billford wallet - With a duo-color construction, and a sturdy coin compartment, this is nothing less than what a gentleman would carry. Picard Milan leather wallet - A simple and functional wallet in classic tan. The Arbor rosewood watch - A lightweight wood watch designed for everyday use. Lightweight, comfortable, and unique, the watch is made from high-quality rosewood, Japanese quartz movement, and scratch-resistant sapphire crystal glass. Artwork titled "The Gathering Storm" by Casey Fallon - For the guy who needs some drama in his life, and on his walls. Artwork titled "Burnt" by Cédric Quissola - For the man who loves graphic and intriguing works of art. "Add water and soap" Laundry bag - If he needs a bit of humor to get on with household chores, this might do the trick. Suspension bridge shelf - For the man who loves architecture and clever design. Personalized tree trunk glassware - A pair of hand-engraved sweetheart glasses to make those celebratory moments extra special. For this special season, purchase a gift card for your loved one to commission a meaningful work of art with any one of our artists. If you missed it, remember to check out our unique gift picks for ladies!